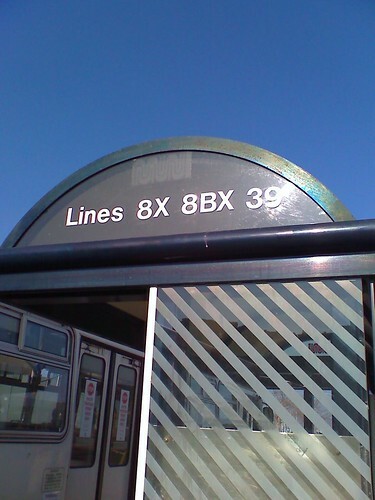 UPDATE: SFMTA Board states the 8X, 8AX, and 8BX are not considered part of the "premium pass" option. So basically, it's the so-called "peak hour" express lines such as the 38AX, 38BX, 31AX, 31BX, etc. It doesn't make a lot of sense to me of why the SFMTA Board of Directors wants to vote on denying passengers the right to use their "M" pass on express lines and only allowing the premium "A" pass be the only sole pass allowed for adults. From a recent article from SF Appeal, Eve Batey asked some more in depth questions about the proposal, and the answers she received showed just how messed-up Muni is. Instead of allowing passengers to use their "M" pass and pay an additional surcharge (e.g., 25 cents), Muni's interpretation is that "M" pass holders will pay the full $2 price. I don't support any surcharge or restrictions to a "Muni Only" pass, but if there needs to be some fair middle ground, do a surcharge like they do for VTA. VTA gives passengers a fare credit if they have a non-express monthly pass or a non-express day pass, and they pay only an extra $2 for the privilege (instead of paying the full fare of $4). In Muni's case, any cash paying customer won't be affected, but a "M" pass user is cheated out of an extra $2, or will have to suffer with paying for an "A" pass that will add $120 a year. But even worse is the 8X-Bayshore Express line. That line is more than an express, it makes a lot of local stops along its route. It is heavily utilized by the folks in Chinatown getting to Market street, but if Muni rejects the "M" pass, you can expect more passengers to load-up on the 30 and 45 lines, or try to cheat their way onto the bus through the back doors. The route also enters the lower income portions of the city including some of the city's housing projects and Vis Valley. Can the adults afford to pay the extra $10/month or $120/year additional charge so they can get to their jobs in downtown, get their education at City College's Ocean campus, or do their grocery shopping in Chinatown? "Express Route Premium Monthly Pass (excluding the 8AX and 8BX express routes)" which will give passengers to ride the regular, limited, metro, and expresses (except Candlestick). "Cable Cars Premium Monthly Pass" will allow passengers to ride regular, limited, metro, and Cable Cars. Why would Muni even sell more passes to complicate the system? Why FOUR PASSES? Can't they just simplify with the current two pass structure? A basic pass and a premium pass? Hey, Akit. That's exactly what I was asking the MTA about in my story you so kindly linked to. But, yeah, I confirmed with the MTA that the plan is NOT for separate passes -- they're just broken down in the PDF in a way that appears confusing. So no, at this time, there's just one pass, the A pass, that would act as the pass for any of those "premium" services (Express, Cable Car, BART). It's not a multiple pass per service plan. Yeah, that PDF is really confusing. At least the MTC docs are easier to read. I just got one question: What about the senior/disabled/youth who ride the express buses? Surely the youth/senior/disabled pass will be honored, no? I'd assume that a senior, youth, and disabled pass would work fine for all modes of transit. That's a good follow-up question for Eve. Thanks, Akit! I didn't want to swipe from you, but I'm happy to look into for y'all. Stay tuned! Just buy the cheapest Pass. The operators won't/can't enforce the correct fare.